Recently, a Chevy Bolt driver was spotted on the road, doing everything but actually driving the vehicle. What would you think if you clearly saw another driver with both hands off the wheel, attention on a cell phone, and the vehicle in motion? You’d likely think that this vehicle is one that wasn’t being operated safely and wonder if the driver was distracted and shouldn’t be behind the wheel at all. Such was the case of one Chevy Bolt EV operator recently, but there’s much more to this story than just the fact that the car was being driven by something other than the person in the seat behind the wheel. The General Motors subsidiary, Cruise Automation, has been working to create self-driving Chevy Bolt EV models that can be enjoyed on the roads that we travel every day. The goal of this program is to build a car that doesn’t even have backup controls present in the vehicle to give a secondary control system that would take over if the computers fail. This means that Cruise Automation is working to make sure the computerized controls and automated systems offered of these cars won’t be able to fail or will have their own failsafe systems in place. When Should We See More Self-Driving Cruise Automation Vehicles? GM has stated they plant to release fully autonomous cars through the Cruise Automation program next year. It’s not likely, but also not impossible, that we’ll see autonomous options released as existing models, like the Chevy Cruze or Malibu; at least, not quite yet, anyway. The production models of the Bolt EV models that will be used won’t have pedals or a steering wheel for manual controls. The cars will be equipped with redundant safety features and collision protection equipment that will ensure the drive can be safe and passengers kept secure while they are in the vehicle. Certainly, there will be more testing that will take place before these vehicles are offered on public roads. The recent view of the driver that was captured in spy shots sitting behind the wheel of the Bolt EV with his hands on a cell phone makes us wonder what this driver was doing. The phone was sideways in both of his hands as if he was playing a game or texting. It’s possible he was capturing video or monitoring the data of the vehicle to offer feedback to Cruise Automation and everything he was doing was related to the performance and drive of the vehicle while on the road. 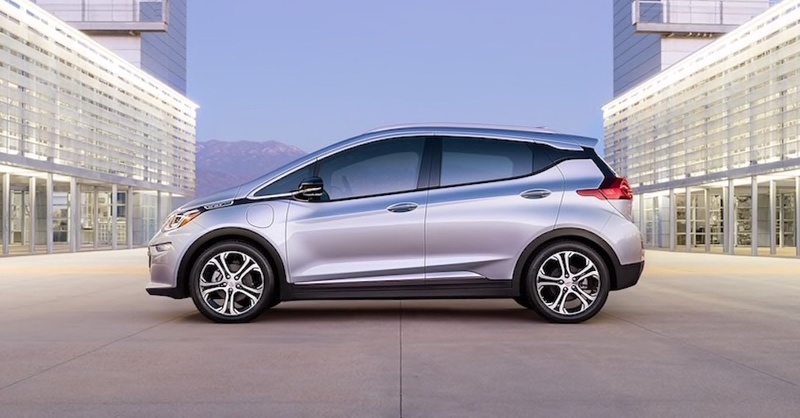 The new Chevrolet Bolt EV models that will be used by Cruise will look different from the rest of the Bolt models. These cars will have a flat nose with only a slight bulge and there will be several antennae on the roof to help with the different systems that will be used. It’s possible the new car will be called the AV1 as a tribute to the first electric car from GM which was called the EV1. The future of self-driving is right around the corner and we may see more drivers that are on their cell phones while the car does the driving for them.